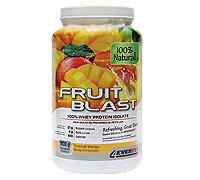 4EVER®FIT's 100% Natural FRUIT BLAST™ the Isolate is flavored with Real Fruit and uses all natural sweeteners. You won't find any artificial flavors, colors or sweeteners in this protein. What you will find is an all natural whey protein isolate that uses an unique combination of cross-flow ultra filtration and advanced mico-filtration. This gentle process ensures that the proteins are not denatured and allows the whey proteins to be recovered in their natural proportions in the final product. ZERO FAT AND ONLY 100 CALORIES! FRUIT BLAST™ the NATURAL delivers the highest Branched Chain Amino Acid (BCAA) profile and is rapidly absorbed for powerful and effective lean muscle gain. 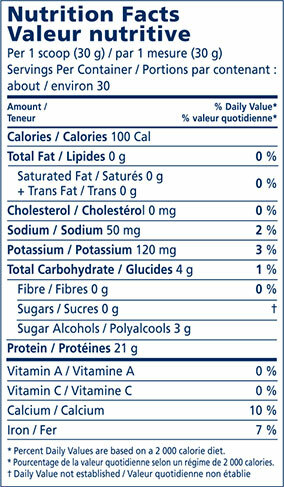 Each serving contains 21 grams of protein, ZERO fat and only 4 grams of carbohydrates. It's perfect for any low-carb diet plan. FRUIT BLAST™ the NATURAL supplies your body with whey fractions that include glycomacro-peptide, alpha-lactalbumin, beta-lactoglobulin and immunoglobulins. These valuable fractions support the immune system, assist recovery and boost essential amino acid content. FRUIT BLAST™ the NATURAL provides maximum nutrient utilization with none of the digestive system discomfort that can be caused by lower-quality proteins. Low in calories and lactose, FRUIT BLAST™ the NATURAL should be appropriate for anyone with milk allergies. The best-tasting protein also mixes with a spoon. Mix one or two scoops of 100% Natural FRUIT BLAST™ the Isolate with cold water to make a delicious and refreshing protein drink. Use milk or juice to create a thicker smoothie-style drink. FRUIT BLAST™ the NATURAL is completely soluble, so there's no need for a blender or any messy clean-up. Scoop, mix and enjoy! Who knew staying fit could taste this good!